Manufactured by Mecalac, this is the 12 MXT wheel excavator. 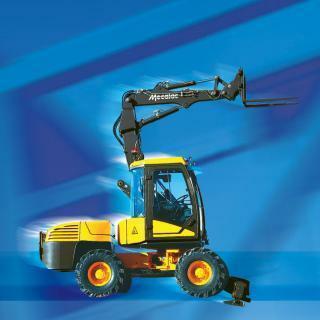 Find and download detailed specs and data sheets for this machine here. The Mecalac 12 MXT is a 9.44t machine with Cummins engine which powers this model with up to 74kW or 99 horse power. The Mecalac 12 MXT can be grouped in the smallest machine segment in the wheel excavators category. The 12 MXT’s size is 2.33m x 4.45m x 3m. The bucket of 12 MXT has a capacity of 0,34m³ which is average for this type of machine. The 12 MXT is manufactured and distributed with Overload alert. It has been sold without air Quick hitch mech., Cabin adjustment and Material Handling Excavator as of 2009. There are more detailed specifications and machine descriptions available in the original Mecalac 12 MXT specs data sheet. You can download it for free in German on LECTURA Specs. This model can be acquired for a list price between €116000 and €147000. Production of the 12 MXT stopped in 2009. For more detailed information about pricing and current residual values, check out the LECTURA Valuation system. The most commonly viewed Mecalac models of this type on LECTURA Specs are the 12 MTX and 714 MW e, and 2 other wheel excavators, which currently range from 9.7t up to 13.3t are also available. Throughout the production cycle of this 12 MXT wheel excavator, there have been around 2 models that average a price of €24600 for an age of 11 years Want more detailed specifications? Download the latest Mecalac 12 MXT specs data sheet on LECTURA Specs today!